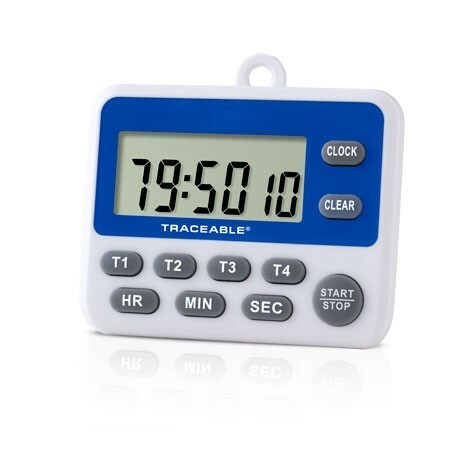 User-friendly and Innovative 100-Hour Timer fulfills virtually every lab timing requirement. Timer operates on all channels simultaneously; it has four countdown channels, a stopwatch channel, and a time-of-day channel that work with an uncompromising 0.01% accuracy. Multi-channels both up and down to 99 hours, 59 minutes, 59 seconds. Unique thru-zero feature allows counting down, alarming, and counting up. A time-out mode stops the timer for off periods in both up and down timing. T1 through T4 may be started simultaneously or individually. Extra-large, 1-inch-high display and vivid LCD digits continuously show the time remaining and are readable from 6 feet. It’s the workhorse of the lab.